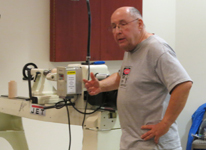 Program: Bob Bley will cover stone inlay. Presidents Challenge: Urn, sized for a pet. November Meeting: Harvey Klein will turn an ornament. Held at the Bridges Church in conjuction with the Silicon Valley Wood Turners. We have set a high bar for professional demonstrators. You have now had an opportunity to see 3 of the best pure turners in the world, at least IMHO. I hope you enjoyed Glenn's demo as much as I did. If it was because of any poor video photography, well sorry I'm not a professional! Karl did a great job improving our audio by hooking it into the church's speakers. We are lucky to be able to use their excellent A/V equipment. Looking forward, we are going to try to collect ideas on the kinds of demonstrators we should be pursuing. Our joint partnership with SVW on this has been excellent. The next demonstrator will be hosted by SVW, bringing in John Beaver. He did an excellent job of demonstrating in Phoenix at the AAW symposium so don't miss this one! Don't forget, it is time for elections at our October meeting. So if one of the 4 elected positions is something you would like to take on, please let me know. I've been talking about doing some traveling, but one thing has lead to another and we haven't gotten around to it. Well, I'm hoping to do it this next year, so I won't be running for president next year. Feels a little weird to be talking about this, having only been in the job for 8 months, but we won't turn over the reins till January. So I have a little more time. We will have our next board meeting on October 20, so any new officers can come and see how we are operating. I've made a number of needle cases over the years and made one for my wife some time back. She was very pleased until she found that when she dug around in her sewing basket, the lid could come off and dump her needles into the basket. Until I obtained the Ray Isles thread chasers, none of my chasers would enter such a small hole as is needed for the needle cases. When I started to make one of these, I tried to use the Nova chuck with the 25mm jaws to hold the pieces while threading. This worked fine for the lid, but I had troubles with the wood moving in the chuck when trying to chase the outside threads for the body of the case. 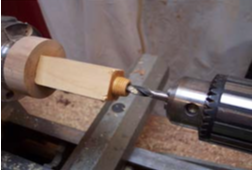 I solved this problem by turning tenons on each end of the blank and gluing on a two inch disk to be grabbed in the 50mm jaws of the Nova chuck as shown below. The blank with two disks glued to the ends for greater stability when threading. 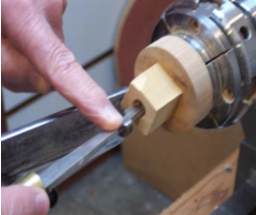 Although it is not needed on the lid side, it is easier to set up the pieces for use in the same chuck. This solved the problem of having the body of the needle case move while chasing threads. 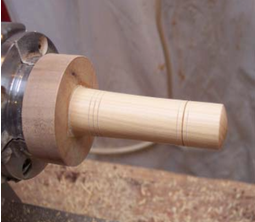 The next step was to part off the lid and mount it in the chuck for drilling and threading. I thread the lid first whenever possible. In the photo below the lid section is shown in the chuck before drilling. The lid is ready to drill with a 7/16" drill to a depth of about 1/2". Threading the hole in the lid with the inside chasers. Drilling the 5/16" hole to hold the needles. It can be drilled before or after threading. Drill a 7/16" hole in the lid section that is about 1/2" deep. Then round over the front edge of the hole and cut a recess in the bottom of the hole to allow the chaser to cut a clean thread before it would hit the bottom of the hole. When the threads are satisfactory, you are ready to mount the base section for drilling and threading of the tenon that will be threaded. Threading the tenon on the top of the base section. The sizing of this tenon can be calculated from the information supplied on the illustration on page 6 of this issue. 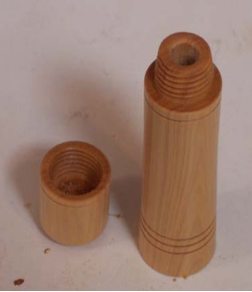 For this case (with a 7/16" recess in the lid section) the tenon should be slightly over 1/2". I found that a 1/2" tenon cutter would cut a tenon just slightly over 1/2" and would work well for sizing the tenon on this project. 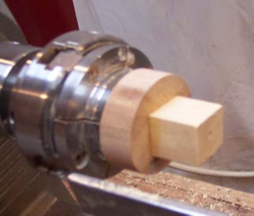 I cut a tenon about 3/8" long with the tenon cutter and then cut away the excess down to the tenon. I then used a thin parting tool to make a recess at the rear of the tenon and rounded over the front edge, before hand chasing the threads. Incidentally, the threaded section is 16 tpi. On this project, I drilled the 5/16" hole for the needles after I had chased the threads, but it can be drilled just as well before cutting the threads. With the threads cut and the lid fitted to the base section, it is time to final turn the outside of the needle case and put in a few decorations with a point tool or a skew. In this photo, the outside of the needle case has been turned and it is ready to part off just in front of the disk holding it in the chuck. This is the completed needle case. I simply sanded the base smooth after parting off. I like to put a bit of a shallow curve to the outside of the needle case. It seems to me to give it more elegant look than if it is just straight sided. You can also put some sort of decoration on top of the lid, which I do sometimes. However, Mildred likes the smoother top and since she is the one who will be using these things, that is good enough reason to make them smooth. 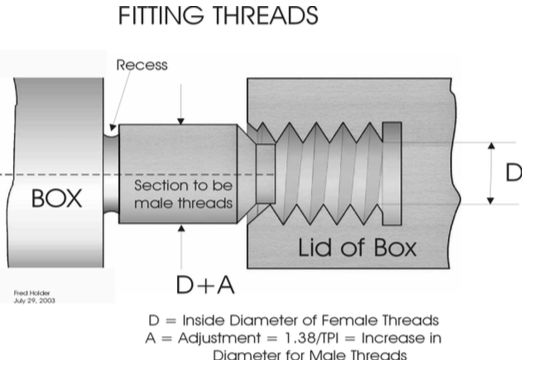 This drawing illustrates how to calculate the size of the tenon for the male threads when the diameter “D” of the inside threads are known. If you don't have any boxwood or other hard, dense woods, you have two other options. You can use material such as Corian, which threads very well. Or you can cut recesses in both the top and base sections and pour it full of epoxy. 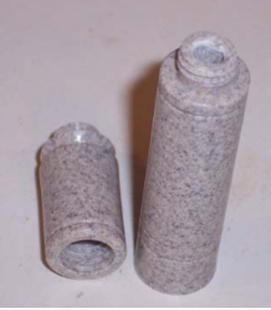 The finished needle case with the lid removed. 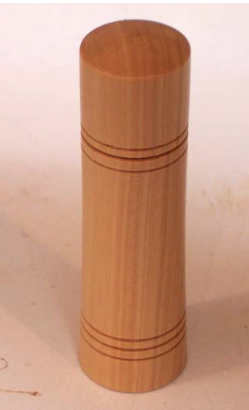 A needle case made from Corian. Corian threads very well. This one was not held with the disks, but only in the 25mm jaws of the chuck. 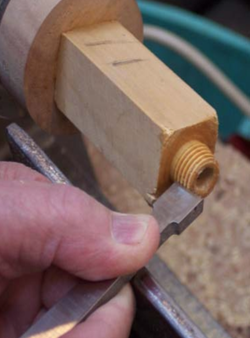 I broke off the threaded tenon once and had to shorten the case. Epoxy also threads very well. I first learned of this technique from Petter Herod of Norway. I've found that a 3/8" tenon cutter that I have works well to cut the recesses for the epoxy, but make sure your epoxy is mixed thoroughly. It must set up properly to work well. Of those who commented about last month's newsletter article, three liked it, zero did not like it. Therefore we have another this month. But we still do not have a good indication about whether the article is worth publishing. It is much work to format it for this newsletter, so if it is not read and appreciated, it will not be there in future months.. So, please let me know that you like it or not.